I was born in Alabama; my family had 25 acres of land on which I grew up. My family and I did a lot of farming: picking cotton, corn, tomatoes, cabbage, and collard greens. When I was still young, we moved to Atlanta, but we always had a garden. A year ago when we were talking about new projects to do at Mercy, I suggested that we have a garden. The church does not have any land though, so we could not do it. When I was at the library a couple weeks ago, I was reading the weekly newspaper, Atlanta Intown. I found an article about Concrete Jungle; I thought it was really cool that they shook trees to get fruit and donated it to the homeless. I got really excited about it and showed the article to one of my pastors. I learned that Concrete Jungle donates to us at Mercy and that my pastor farms with them. I went to the farm that weekend to help out. 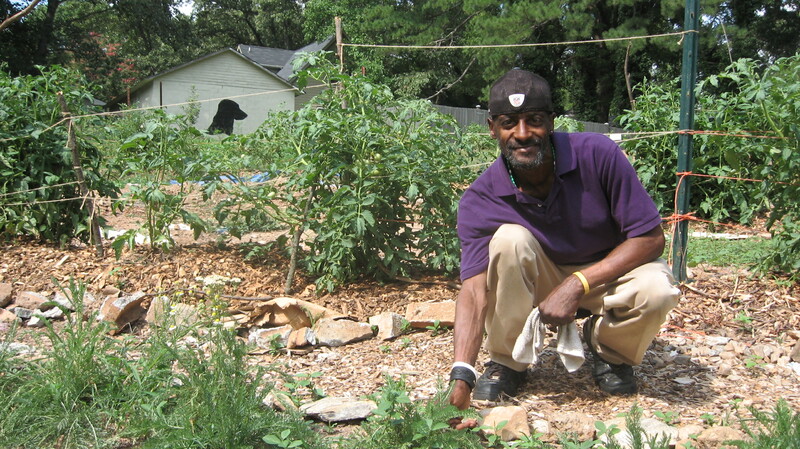 When I got to the farm I saw a huge field with ten to thirteen garden beds with tomatoes, collard greens, cabbage, and watermelon growing. After meeting some of the other volunteers, I got right to work pulling up weeds, making tomato cages, watering plants, and digging beds. I talked with the Concrete Jungle people and learned about how they started the organization. I really enjoyed being outside and doing something different. It was a good change of pace from reading in the library. I am looking forward to going back soon!